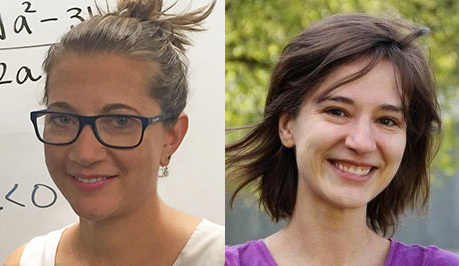 The 2016 IMA Prize in Mathematics and its Applications is shared by Deanna Needell, an associate professor in the Department of Mathematics at Claremont McKenna College, and Rachel Ward, an associate professor in the Department of Mathematics at the University of Texas at Austin. While Needell is recognized for her contributions to sparse approximation, signal processing, and stochastic optimization, and Ward is recognized for her contributions to the mathematics of machine learning and signal processing, much of their research overlaps. It is not surprising that Needell and Ward are frequent collaborators, as both are lauded by their peers as being among the most talented applied analysts in the country. Their most oft mentioned work in respect to this award was their 2013 paper on “Stable image reconstruction using total variation minimization,” published in the SIAM Journal on Imaging Sciences. “This gave theoretical guarantees for total variation minimization in compressed sensing, which prove that given undersampled measurements of some signal (e.g. an image), one can search for the signal with the same measurements that has the lowest variation – that is, smallest gradient – and that this reconstruction yields near-optimal error,” Needell explained. A particularly striking application of these principles arises in medical imaging. Consider magnetic resonance imaging (MRI), where the underlying image to be recovered is, say, a horizontal section of a brain or neck. Like most natural images of interest, this section can be thought of as a two-dimensional function that will be constant or slowly varying over most of the domain, interrupted only by sharp changes across a low-dimensional set of values corresponding to edges. At the same time, each measurement in an MRI scan corresponds to a Fourier transform component, representing the response of the image to a particular frequency. Each measurement takes time and costs money, and thus it is desirable to obtain high-quality MRI reconstructions using as few measurements as possible. Other applications for this type of data acquisition and analysis include sensor and distributed networks, statistical problems, compression, and image processing problems. Ward credits her Ph.D. advisor, Ingrid Daubechies, for getting her interested in these types of problems. “Her construction of compactly supported smooth wavelets. The combination of practicality and mathematical beauty blew my mind,” Ward said. Needell’s Ph.D. advisor, Roman Vershynin, had a large influence on her career as well, having introduced her to the field and to her first experience in real mathematical research. It also helped that she enjoyed classes in probability and analysis, and it turned out that these topics were used in a lot of results of compressed sensing. “Even though compressed sensing is an applied field, it uses many tools from ‘pure math.’ So for me, it is an area that is the best of both worlds,” Needell noted. Needell is also expanding her research horizons into methods for stochastic and combinatorial optimization. Ward plans to spend a sabbatical year working in industry doing machine learning research. “It will be good for me to get out of the ivory tower for a while and face the applications head on,” she added.